Price includes all breakfasts, all lunches, all dinners (except transition night between tours in Guadalajara if adding on the Tequila tour), all beverages (except optional extra drinks), all hotel accommodations, all distillery tours and tastings, and all bus transportation. Air and taxi fare is NOT included. We reserve the right to adjust the final price accordingly if the exchange rate drops below 18 pesos to the US dollar. On Tuesday morning, those of you continuing on to Oaxaca from the Tequila tour, will check out of Hotel Morales by 6:30 in the morning in order to make it to the Guadalajara airport by 7:00 in order to get on your flight by 7:39. It's a non-stop flight scheduled to arrive in Oaxaca at 9:19. Add some time for the taxi (about $5-6 per person) and with any luck we should be at the hotel by 10:30 at the latest which will give everyone 5-6 hours of free time to unwind, enjoy the pool, or get a head start on exploring the town which is a five-minute walk away. Those of you who are not going on the Tequila tour just need to get to Oaxaca on your own and meet up with everyone at the hotel that afternoon. Around 4:30 or so, we'll meet for an impromptu cocktail reception in the small park less than a block from the hotel. There are two restaurants there that make great to-go cocktails for about $3-4 so we'll order up and hang out in the park for a bit until our private double-decker bus shows up to give us a tour of the city. (And yes, of course you can bring your cocktail on board!) Those of you not interested in the optional cocktail hour just need to show up at the park by 5:30 to meet the bus. The bus will tour the town for about an hour or so, so you can get your bearings and see the landmarks. Then we'll be dropped off in the historical central district and walk a few blocks to Las Quinces Letras for a cocktail reception and a mole cooking demonstration. The demo will be hosted by none other than Celia Florian, the owner and internationally acclaimed expert on Oaxacan cuisine. There are seven basic moles in Oaxaca (and over 130 variations of those), but the most difficult one to make is called Mole Chichilo. I'm probably getting into way too much detail here but that's the one Celia is going to make for us. Its dramatic preparation involves igniting tlayuda (Oaxacan-style tortillas) which produces a fireworks show of sparks over the mole as it's cooking. After the class we’ll enjoy a traditional Oaxacan dinner including some of the mole that was just made paired with some Valle de Guadalupe wine. After dinner we’ll make the ten-minute walk back to the hotel (or take a taxi if you wish) and call it an early night. After breakfast (included) at the hotel the next morning, our bus will pick everyone up at 9:00. From here we’ll head to Matatlan, a tiny village that's also home to the most Mezcal distilleries in the world. First stop will be at Gracias a Dios Distillery where you’ll get an overview of the distillation process from start to finish. This is the only distillery in Matatlan that also makes an agave-based Gin which is actually quite delicious. We’ll start with a gin cocktail and then conclude with a sampling of their Mezcals, some of which are made from wild agaves. Next stop will be one of the most respected producers in Matatlan, Mal de Amor. This is where the well-known "Ilegal" brand of Mezcal is made and also where my friend Larry of Cantina Mayahual right here in San Diego makes his Casa Don Lorenzo Mezcal. They’ve got a beautiful facility and make about a dozen different types of Mezcal (many from rare wild agaves), and yes, you can taste as many as you want. After the tour and tasting, we’ll have a traditional “parrillada” lunch of grilled meats, chorizo, guacamole, tortillas and all the accompaniments on their patio along with some specialty Mezcal cocktails and cervezas. Final distillery stop of the day will be at Casa AGP, a large-scale producer Mezcals. (Think "Cuervo" of Oaxaca.) We’ll visit their state-of-the-art production facility and beautiful tasting area within a museum-like boutique that showcases the work of local artisans and artists. This area is brand new, so we'll be among the first people in the world to visit it. After the tour we'll enjoy a Mezcal-based cocktail followed by a tasting of their premium Mezcals. From there we’ll start heading back towards the hotel, but we'll make a detour along the way into the tiny village of El Tule. El Tule's claim to fame is that they are home to the widest (yes widest, not tallest!) tree in the entire world. We'll make a quick stop to see the tree and then walk two blocks to La Soledad restaurant. La Soledad is owned by my new friend Victor who is the cousin of one of our regulars who made the introduction. It's a very traditional, definitely not fancy restaurant that serves amazing local cuisine. We will be enjoying a parrillada (an assortment of sliced meats and sausages) served tableside on a hibachi-like, coal-fueled contraption. Basically, Victor puts a couple of glowing coals in the base, places a large pizza-tin-like plate on top, and then loads up the plate with the meats. Everything then sizzles away right in front of you on the table. Then you grab a fresh tlayuda, add the meats you want, plus guacamole, pico de gallo and salsa and chow down. But wait! There's more! So when I was doing recon, I obviously had this dish, but my only complaint was that it cooked too fast and dried out the meats before you had a chance to eat them. While the first serving to come off the plate was perfect, subsequent ones were cooked a tad more than this "California-boy-who-likes-his-steaks-cooked-medium-rare" preferred. So, on the DL, I took the liberty of discreetly pouring a couple ounces of my beer onto the sizzling plate. It obviously instantly turned to steam, but in the process, basically braised the meats into succulent tenderness. Viola, mission accomplished, and even die-hard traditionalist Victor was impressed with my new technique. But we're going to kick it up a notch for the tours. Basically, we're going to let everyone take their first serving just as the sizzling meats come to the table. But then we'll add pico de gallo directly to the dish (so the diced tomatoes "melt" into the meats and the onions caramelize), then add a squeeze of fresh lime, then a shot (or two) of Mezcal, and finally a couple ounces of beer. The result should be an amazing blend of complex wonderfulness from the liquids deglazing the pan and the resulting tenderness of the meats as the liquids steam through. I don't know about you but I'm getting hungry just reading this! After this simple yet incredibly satisfying dinner we'll make the short drive back to the hotel for the night. I purposely made this an early return time to the hotel to give everyone ample time to explore the town on their own, or to just call it an early night. After breakfast at the hotel our bus will pick everyone up at 10:00. Our first and only distillery visit of the day will be at Don Agave distillery. 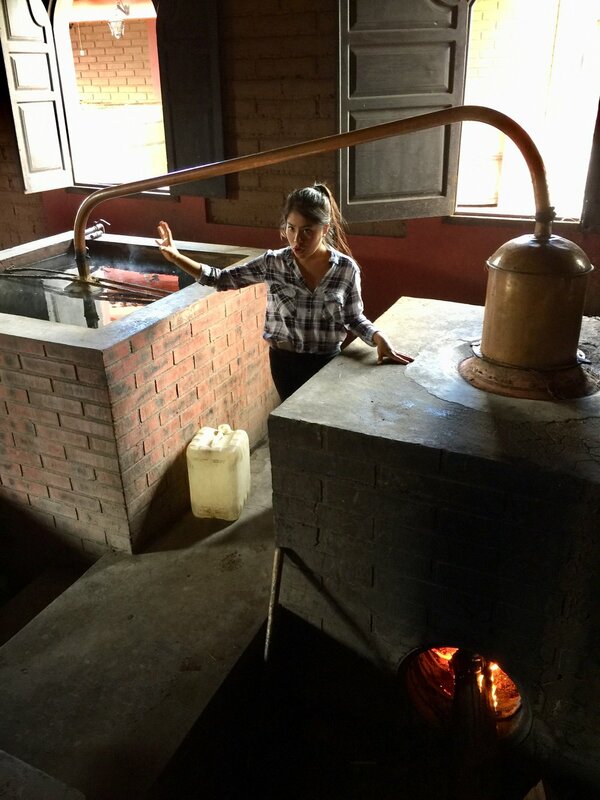 This is one of the more progressive distilleries in Oaxaca that definitely still adheres to tradition but also utilizes a few slightly more modern techniques. (Everything in Oaxaca is painstakingly labor intensive and adamantly adheres to not-necessarily-efficient traditions, so there’s no rushing anything. It happens when it happens … which can take a little getting used to for any of us "Type-A" personalities.) At Don Agave you’ll see the entire Mezcal production process from the agave roasting pits, to the horse-drawn mill stones going around in endless circles pulvarizing the roasted agave, to the wood fermentation tanks, to the stills. While it’s unlikely that we’ll see every aspect of the entire production process at any one distillery (because the entire process takes about a month), my hope is that we’ll be able to see all of the individual aspects in action over the course of visiting several distilleries. This way you'll get an overall perspective of the entire process even if you see it out of order. By this point in the tour everyone will be a walking encyclopedia on Mezcal so I thought it would be fun for a non-Mezcal diversion. Each village in Oaxaca is known for a specific artisanal craft and, since we're going to be right next door to Teotitlan which is the weaving capital of Oaxaca, I thought it would be fun to see that fascinating art in action. But wait, it's time for lunch right?! So we'll first stop at Tierra Antigua for a casual lunch. Owner Carina, who like Celia at Las Quince Letras, is a well-known chef in Oaxaca and a master at making moles. Upon arrival, we'll be greeted with a Mango Mezcal cocktail with some appetizers while Carina demonstrates how to make one of her moles. So, you'll get two mini cooking lessons from two rock star chefs on this tour: one from Celia at Las Quince Letras and one from Carina here! After the demo we'll have a lunch of traditional chicken and rice served with a duo of moles ... one of which you will have just saw being made! After lunch we'll take a five-minute drive into the heart of Teotitlan to visit Bulmaro at Father and Son's Rugs. Bulmaro is hands down the most famous weaver in the entire area, and has been featured on many documentaries around the world. He will first demonstrate how he make the dyes from 100% natural ingredients. The red dye is perhaps the most fascinating to watch as it is literally made by crushing a tiny bug that burrows into cactus plants. The addition of lime, crushed limestone, nutshells, etc. each change that single color into an amazing spectrum of over 100 different and distinct colors. It's absolutely fascinating to watch! After that you’ll see the master weavers in action on their lightning fast looms. Then, of course, there will be plenty of hand-woven items for sale at uber ridiculous low prices if you’d like to take anything home. The tour is officially over when you wake up the next morning. For those of you returning back to reality in San Diego, there’s a 7:46am direct flight that will get you into Tijuana at 9:53am local time (remember, you're now re-gaining those two hours you lost coming down). And for those of you extending your tour to other parts of Mexico, well, as my daughter Katie would say, "Have a scandalous time!"